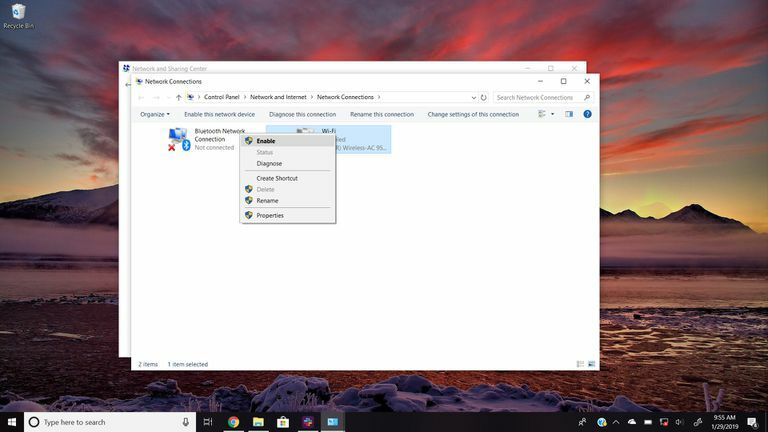 Knowing how to disable and enable network connections in Windows helps significantly with network setup and troubleshooting. Windows allows administrators to manage Wi-Fi and other kinds of local network connections through the operating system. By default, Windows enables and uses network interfaces normally when they're plugged in, including both Wi-Fi and wired adapters. When a Wi-Fi connection (or Ethernet one) suddenly stops functioning because of a technical glitch, the OS might disable it automatically, but users can always do the same manually. If your internet isn't working, disabling and re-enabling the connection resets the network-specific functionality without rebooting the computer. This can clear out certain kinds of network problems just like a full reboot would. Disabling and re-enabling network connections is done through Control Panel. In Windows 10, Windows 8, Windows 7, and Windows Vista, the option can be found by clicking/tapping Network and Internet on the main Control Panel screen. In Windows XP, skip this step and the next one entirely. Instead, choose Network and Internet Connections in Control Panel (in Category View) and then pick Network Connections at the bottom, and then skip down to Step 4. Click or tap the Change adapter settings link on the left of Control Panel to open a screen called Network Connections. This is where all your network connections are located, whether they're Wi-Fi, Bluetooth, Ethernet, virtual, etc. If you're using Windows Vista, choose Manage network connections instead. Right-click or tap-and-hold the connection you want to disable, and pick Disable in the menu. The icon for the connection will become grey to show that it's disabled—it might happen immediately or take several seconds depending on the speed of your computer. If asked to confirm the action, do it, or enter an admin password if you're not logged in as an administrator. If you don't see a Disable option, it just means that the connection is already disabled. Skip down to the next section to enable it again. You should have now disabled the internet connection. Enabling a network connection is very similar, but you'll want to use the Enable option instead. Repeat the steps above to access the Network Connections screen (Step 1 through Step 3). Right-click or tap-and-hold on the connection that needs enabled, and choose Enable. The color should come back to the icon to confirm that it's been re-enabled. If asked, enter an admin password or confirm the action. When you disable your wireless network adapter, you lose Wi-Fi internet connectivity until you re-enable the adapter. The same is true for a wired connection. Make sure you've saved what needs saved in case the connection restart ruins what you were doing (it shouldn't). Device Manager can be used for enabling and disabling network connections as an alternative to Control Panel. To disable a device in Device Manager, open Device Manager, expand the Network adapters section, and right-click or tap-and-hold the entry that corresponds to the network adapter to find the Disable option (enabling devices is similar). Feel free to uninstall connections you're sure you don't need—it could tighten your network security and free up some resources. Windows XP supports a Repair menu option for wireless connections. This feature disables and re-enables the Wi-Fi connection in one step. While this feature does not exist in newer versions of Windows, the various troubleshooting wizards in newer Windows OSs offer the same and more functionality.